The Board of the RHPOA would like to inform you of the following, in advance of the upcoming RHPOA Spring Newsletter. Wondering what markets, bazaars and events are happening around Rothwell Heights and Ottawa as we near the holiday season? Your November 2018 e-Newsletter is now available, and provides some helpful ideas. Your October 2018 e-Newsletter is now available. On October 22, 2018, the city of Ottawa is heading to the ballot box to elect a new city council. 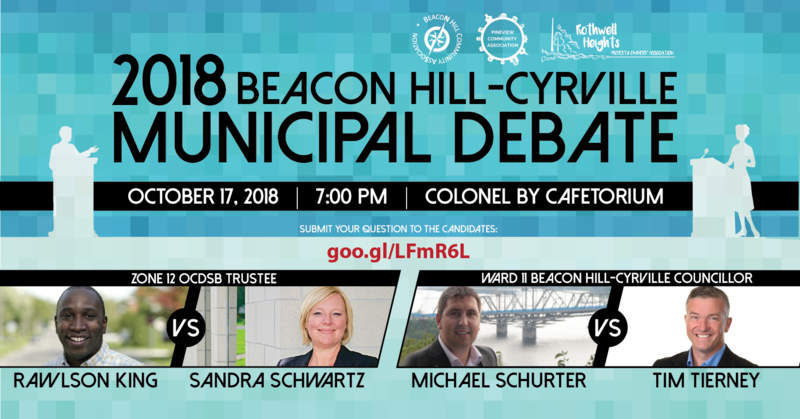 Your RHPOA is teaming up with Beacon Hill Community Association (BHCA) andPineview Community Association (PCA) to host an All Candidates Municipal Debate.